These structures can be customized to accommodate the wingspan of ultralites while still accounting for snow shedding and wind bracing. The challenge encountered when putting a shelter over an aircraft is that the wingspan is often greater then the overall length. Generally speaking, this would require a more expensive structure but we have economical shelter solutions for you to use! For ultra lights and other such light aircraft, one alternative is to make a very low dolly which would allow you to move your craft into the structure sideways. Since most available buildings are taller then they need to be, the profile can easily be modified to create a little more width. When increasing width you will decrease the snow shedding ability. This occasionally necessitates reduced hoop spacing. These are all things to consider as you are planning your structure purchase. Call today to discuss how we can make this work for your plane! 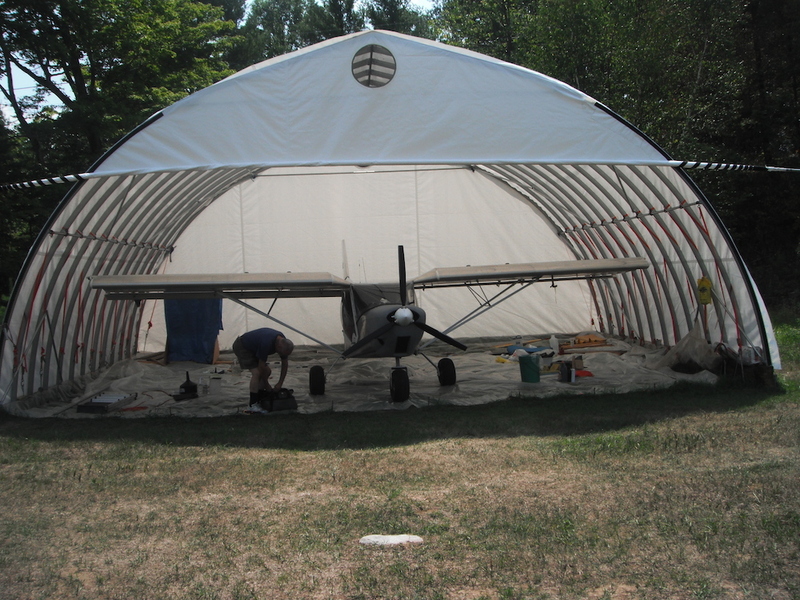 This entry was posted in Application Promos and tagged airplane, airplane hangar, airplane storage, COPA, featured product, how can I cover my ultralite, Multi Shelter Solutions, multisheltersolutions.com, protection for airplanes, protection for ultralites, small aircraft. Bookmark the permalink.